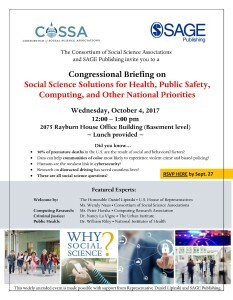 A Congressional briefing hosted by COSSA & SAGE Publishing. 50% of premature deaths in the U.S. are the result of social and behavioral factors? Data can help communities of color most likely to experience violent crime and biased policing? Humans are the weakest link in cybersecurity? Research on distracted driving has saved countless lives? These are all social science questions? This widely attended event was made possible with support from Representative Daniel Lipinski and SAGE Publishing.